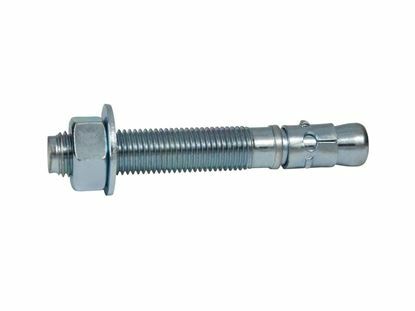 Bit Size 3/8" Minimum Embedment 1-1/2"
The American made 3/8" x 3-1/2" Hot-Dipped Galvanized Thunderstud Anchor (100 pcs per box) are used in solid concrete in an outdoor wet environment. All orders ship immediately for delivery in 1 to 3 days. 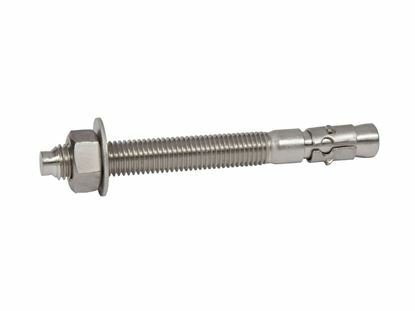 Minimum edge distance is 1-7/8"
Minimum Fixture Hole Diameter (In Place) 1/2"
Maximum Torque 25 - 30 ft./lbs. Wrench Size For Nut 9/16"
The anchor is made from Carbon Steel, and is Hot-Dipped Galvanized and meets the Buy America Act (BAA). 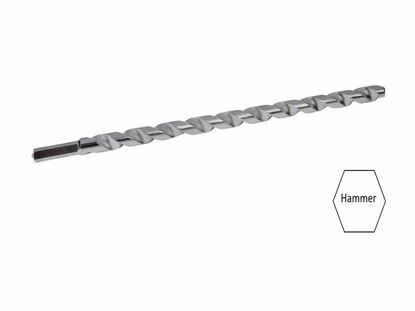 This anchor is designed for use in Concrete only, and should never be used in block or brick base material. The anchor is designed for use in a Damp environment. The anchor requires a 3/8" hole to be drilled in the base material (Concrete only). 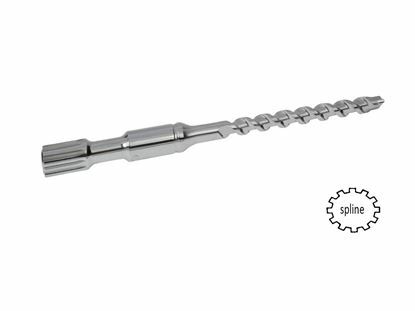 The hole should be drilled with carbide tipped bit that meets ANSI standards and used in a hammer drill. The length of the threads on the anchor is 1-1/4" in length. The anchor is packaged with 100 pieces per box and is packaged with the correct number and diameter of nuts and washers. 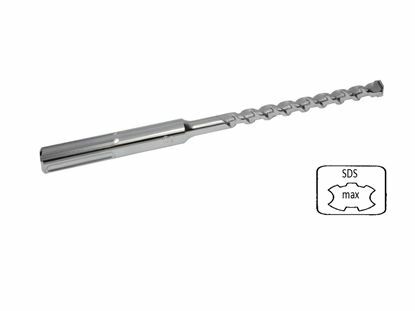 The maximum fixture thickness or the maximum thickness of the material being fastened for a anchor is 1-1/4". This will ensure that the minimum embedment of 1-1/2" will be met. The hole in the fixture or material being fastened must be larger than the designated diameter of the anchor. The 3/8" diameter anchor requires the hole in the fixture to be 1/2". The size of the wrench required to turn the nut to set the anchor is 9/16". To be set properly in the concrete, the anchor must be torqued to between 25 - 30 ft./lbs. Each anchor must be spaced a minimum distance of 3-3/4" from each other when measured center to center. It is very important not to install the anchor any closer than 1-7/8" from an unsupported edge of the concrete. Flush With Concrete - when the anchor is set flush with the surface of the concrete, add the thickness of the material being fastened to the thread length of 1-1/4", and then add the space for any washers used. Below Surface of Concrete - add the depth below the surface of the concrete to the thickness of the material being fastened, then add the space for the washer, and, finally, add 1-1/4" for the thread engagement. 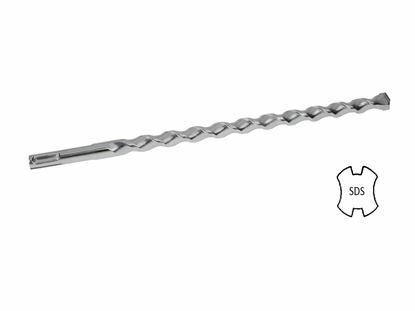 Drill a 3/8" hole into the concrete using a carbide-tipped bit that meets ANSI Standards B212.15. Drill the hole a 1/2" deeper than the anchor will penetrate the concrete, making sure the minimum embedment requirements of 1-1/2" is met. The hole can be drilled while the fixture is in place. 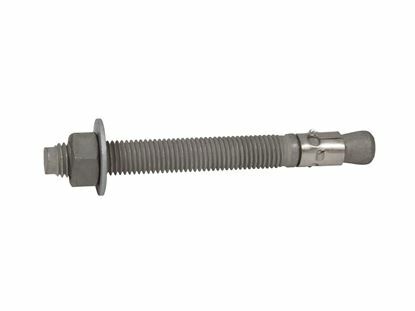 The minimum hole in the fixture for the 3/8" x 3-1/2" Hot-Dipped Galvanized Thunderstud Wedge Anchor is 1/2". 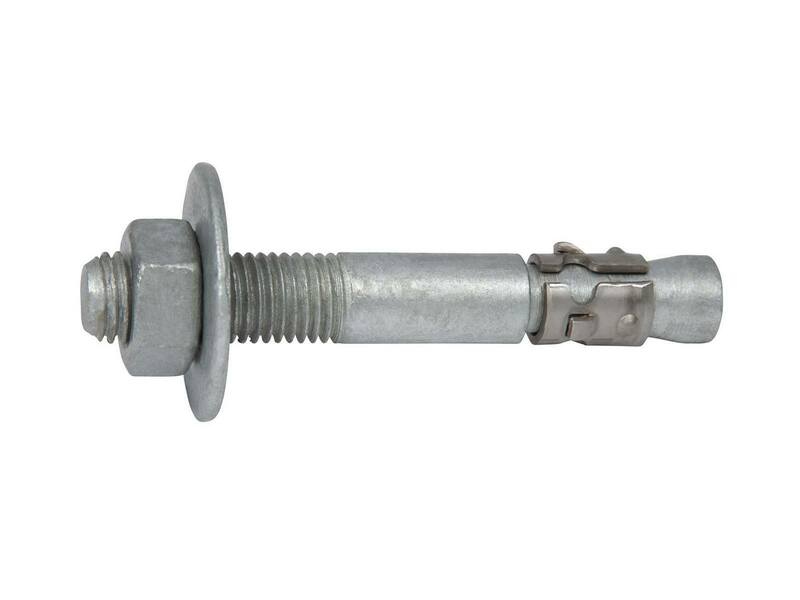 Put the nut and washer on the 3/8" x 3-1/2" Hot-Dipped Galvanized Thunderstud Wedge Anchor, making sure the nut is on the last threads; this will protect the threads from damage when the wedge anchor is hammered into the hole and into the concrete. Using a 9/16" wrench, turn the nut 3 to 4 times until snug or until the proper torque value of 25 - 30 ft./lbs. is reached.